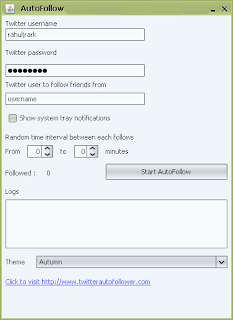 After the launch of AutoTweeter, @titochayan is back again with another great Twitter Tool called Twitter AutoFollower. 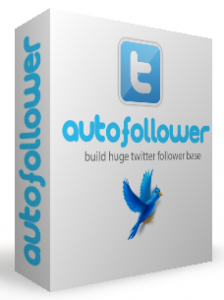 This is a wonderful tool that will help you to increase followers on Twitter. You can easily get more Twitter followers without much effort. This is what the creator of AutoTweeter has to say about it. If you follow 100 people in twitter , there is a high probability that atleast 50% of them follow you back,provided following you back is really worth.So if you think you tweet really well and need to build up followers very fast,this tool is your choice. The thing that sets apart this tool from other tools is that you can choose the person whose followers you want to follow. With this you can ensure that you are always following the right people. Using this tool is very simple. All you need to do is enter your Twitter username and password and the username of the person whose followers you want to follow. Twitter AutoFollower fetches the first 100 followers of the user who you have selected and starts following them one by one, randomly. As a result Twitter can't suspend your account due to mass auto follow. You can choose the time interval between each follow. Just choose a number in the From __ to __ minutes section. As seen above, the tool will have a minimum interval of 2 minutes and maximum of 5 minutes between each auto follow. You can set the value as per your choice. As a result you wont follow a large number of people in an instant. Also, Twitter AutoFollow can follow people at a really fast speed. According to a test carried out by its creator, Twitter AutoFollower followed 10 people in just 13 seconds which is very quick compared to other tools available online. It runs from the system tray and hence doesn't occupy space on your desktop. You also have the option to switch off the system tray notifications if you don't like them. You can only follow 5 people at a time.After 5 people are followed,the program stops following. You have to start the follow process again for following the next followers. An AD will be sent once to your twitter account about information regarding twitter autofollower.